I just wanted to let you know that I received the giclee today. It arrived in perfect condition and is even more beautiful than I thought it would be. The paper is exquisite and the quality is incredible. My husband is an artist and he was overwhelmed by the quality of the Bird of Paradise, and the beauty of this piece. It is truly a beautiful work of art. 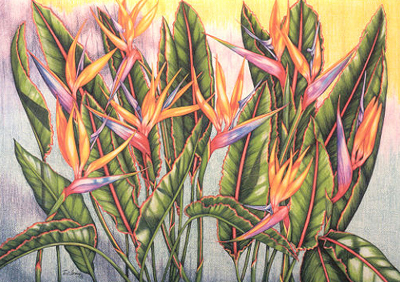 I highly recommend the Bird of Paradise Giclee to web shoppers everywhere. Dealing with your company has been wonderful, you have kept in touch with me and made me feel as if I were very special. Thanks again for the beautiful work of art and your wonderful customer service." "I find these cards quite breath taking. I love the cards and I just wish I could get back to Hawaii to see the beautiful sites, it has been nearly 30 years since I was to the islands, and I loved every minute that I was there. I came home with some very wonderful memories of your fantastic islands." "Wow, Teri's work is simply amazing--literally. I currently have (besides all note-card collections) one print and one giclee print and they are my wife's and my pride and joy. When ever someone new comes to our home, we shortly show them the magnficient art. We have them framed behind glass. After people ooh and aah a little, we then tell them the originals are pencil. Then they are disbelieving--truly amazed! The colors are more radiant, rich and alive than most paintings." SCM-BIRD37 Double Matted Note Card $13.50 Click here for ordering information (write in the comments section the name of the card you would like). SCK-BIRD37 Double Matted Note Card framed in Koa $40 Click here for ordering information (write in the comments section the name of the card you would like). LZR8-7 14" x 11" Double Matted Print $25 Click here for ordering information. LZR8K7 15 1/2" x 12 1/2" Double Matted Print Framed in Koa $67 Click here for ordering information. GIC-BIRD37 18 3/4" x 14" Giclee Print $400 Click here for ordering information. GICK-BIRD37 25 1/2" x 21" Giclee Print Framed in Koa $550 Click here for ordering information.